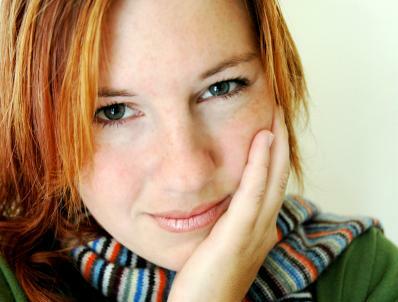 Rosacea is an embarrassing skin condition, so it is no surprise that sufferers often look for rosacea cures. There is no prescription cure, but there some natural ways to suppress outbreaks. Doctors do not know what causes this skin disorder, so finding a real cure is nearly impossible. While no cure is currently available for the condition, some people have experienced lengthy remissions by using home remedies and topical creams. Jojoba oil comes from the seed of the jojoba tree. This tiny seed's oils may offer rosacea sufferers some hope. More like a liquid wax, jojoba oil protects the skin from the elements and moisturizes without causing pain. Jojoba goes on easily and is absorbed into the skin quickly. Find a cream with a jojoba oil base to sooth your rosacea. Chyrsanthellum indicum is just a fancy name for golden chamomile. This calming plant is loaded with phenylpropenic acids and saponosids, which are ideal for treating irritated capillaries. After gently washing your face, apply the cream to the inflamed areas. You will feel your skin become cooler as the capillaries constrict slightly. Topical licorice skin cream is effective for treating mild cases of facial redness. You will need to use the licorice cream for at least four weeks before you see results. You can find herb licorice cream at your local pharmacy or health supply store. Zinc oxide is an anti-inflammatory mineral used in popular mineral powder makeup. Get good skin coverage while treating your skin by applying mineral powder foundation. Besides zinc oxide, the makeup also contains titanium dioxide and offers users valuable UV protection. If you have rosacea consider using mineral makeup. Regardless of your skin type, you will get comforting relief. Prevent rosacea flare-ups by taking certain precautions. Changes in your lifestyle and diet, and using the wrong skin products may contribute to this bothersome condition. Avoid these things to reduce outbreaks and diminish outbreak times. Some facial cleansers: Facial cleansers that contain exfoliants or acids are bad for your sensitive skin. Instead, use a cream-based cleanser with no added exfoliating beads and rinse your face with cool water. Spicy foods: Spicy seasonings, like cayenne pepper and hot sauce, may bring on a rosacea flare up. Avoid eating spicy foods, or at least cut down your intake. Alcoholic beverages: Avoid drinking alcohol if you have rosacea. This is not a rosacea cure, but it may make bouts shorter. Limit your wine, beer and liquor intake to prevent skin irritation. Unprotected skin: Cold, windy weather and hot, humid weather are both bad for your sensitive skin. Never venture out without protecting your skin with a moisturizer appropriate for your skin type. Women should wear hypoallergenic makeup that has a yellow base color; this hides the red rosacea and the makeup will provide a barrier between your skin and the elements. While there are no FDA-approved rosacea cures, there are several ways you can get relief from this painful, often embarrassing skin disorder. Try a few remedies to determine which works best for you.